The ultimate winter pud! 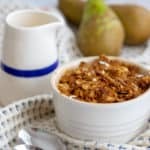 Sweet juicy pears with a kick of gingery heat topped with a nutty oat crumble. Perfect for a dinner party or just a cozy night in. GF, vegan & healthy. Preheat the oven to 170ºc fan/190ºc/380ºf. Peel, core and cube the pears into 3cm chunks then transfer them into a large bowl. Add the lemon juice, grated ginger, ground ginger, cinnamon and honey/maple syrup and give everything a good mix. Divide the pears between four individual ramekins and bake in the oven for 10 minutes. Meanwhile melt together the honey/maple syrup and coconut oil in a saucepan over a low heat. Once melted add the oat flour, rolled oats, almonds and ginger and mix well until everything is combined and crumbly. Remove the ramekins from the oven and divide the crumble topping between them. Return the crumble to the oven for another 25-30 minutes until golden brown and crispy. Serve warm with a dollop of yoghurt, a scoop of ice cream or a splash of custard. This crumble can either made in four individual ramekins as in the recipe, or in one medium oven proof dish. The cooking times remain the same. If you want to make my pear and ginger crumble in advance follow the recipe up until step 4. Divide your crumble mixture over the fruit then store covered in the fridge for up to 3 days until ready to bake. You can also freeze the crumble at this stage for up to 3 months. Just defrost before following the cooking instructions. This crumble topping works perfectly with any fruit. You can substitute the ground ginger with another spice or leave it out all together. A few of my favourite crumble combinations are: Apple, Blackberry & Cinnamon, Rhubarb & Ginger and Plum & Maple. Vegan: Use maple syrup rather than honey, and coconut oil rather than butter. I love using fresh and ground ginger in this recipe as they both bring a different depth of flavour. If you would prefer to just use ground ginger, double the amount to 2 tsp in the fruit filling. I make my own oat flour by just blitzing 50g of oats in a high speed food processor but it can also be brought in good supermarkets. If you would prefer if can also be substituted with a regular wheat flour or GF flour blend.